Philippe Gilbert is a determined sportsman, so determined in fact, he finished stage 16 of the Tour de France with a broken kneecap. And it looks excruciatingly painful. He had a nasty crash on the descent of the Col de Portet d’Aspet after misjudging a bend which saw him fall over a stone wall and down a drop. The Belgian cyclist quickly got back up, but fell down some places in the race as he received medical treatment, according to Cycling Weekly. 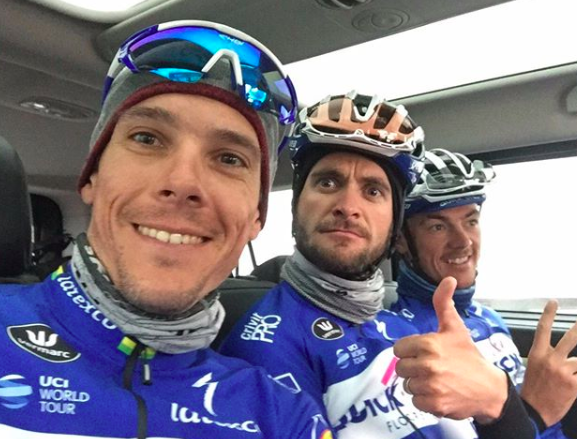 Gilbert completed the final 59km, and climbed two first category climbs to get to the finish line in 142nd place – 31 minutes behind stage 16 winner and his fellow teammate Julian Alaphilippe. He limped onto the podium to receive his prize with blood running down his left leg. Gilbert then understandably needed help getting to the ambulance to receive further treatment. X-rays have since revealed he had suffered a ‘fracture to his left patella’ – sadly meaning he’ll have to be off his bike for ‘four to five weeks’, and out of competitive cycling for ‘at least six weeks’. I’m very grateful for all the messages I have received on my phone and social media, and also to all the riders who passed me and asked me how I was. I’ve got a lot of support from the cycling family and it’s then that you see that it’s really a nice sport. You appreciate it when you get support in hard moments like that. Thank you all for the support after yesterday’s crash. I have done everything I could to continue in LeTour, but unfortunately it’s not longer possible with a fracture of the patella. As always I will come back stronger.